Hmm, I need a catchier name for this garden! Anyway, the 6-bay chicken garden rotation system is a low-labour, high-yield intensive vegetable gardening system designed to produce a continual supply of food for our household throughout the year. The core idea is to have 6 separate fenced-off garden bays connected by a central aisle. Each bay is about 4.5m x 2m (16′ x 6.5′) in size. Five of the bays are growing vegetables at various stages of maturity, and the sixth is open to our small flock of chickens. Our chickens are housed in the scratch yard. They are fed in there, and that’s where we have their water, shelter, nest boxes and roosts. It’s an area about 10m x 4m (approx 30′ x 12′), so plenty big enough for a small flock. I lock them in there at night, since the area is surrounded by corrugated iron and very secure against foxes and dogs. Each morning I open up the gate to give the chickens access to the aisle and the current chicken bay. The other bays have gates to keep the chickens out of the garden beds. The chicken bay is an area where the poultry can dig in the dirt for worms and grubs, have dust-baths, and generally just be happy chickens. We throw in scraps from the kitchen, weeds, and trimmings from the other garden bays for the chickens to eat. I also throw in raked leaves, horse and cow manure, lawn clippings, prunings, etc – anything that you’d normally put in a backyard compost bin – to form a compost pile in the middle of the bay. The chickens scratch through it, cleaning up any stray seeds or insects, mixing it up, and adding their own manure to the mix. 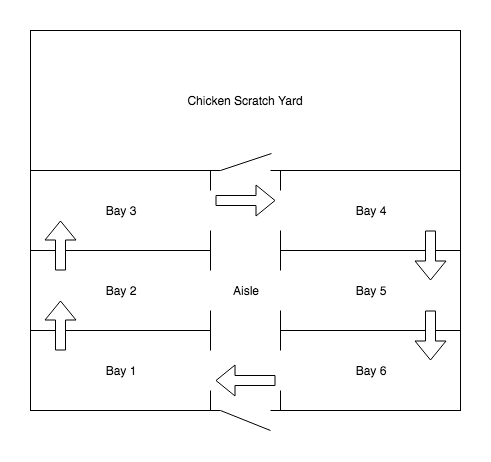 Every month, I rotate the chickens to the next bay in the sequence. This is the bay that has been growing vegetables the longest, so most of the plants have stopped producing and are dying back or going to seed. The chickens attack these plants with gusto! They gorge on the fresh greens, the seeds, the fallen or missed fruit and vegetables. They also clean up all the snails, grubs and other insects that have moved in since the plants were first sown. Meanwhile, I prepare the bay that the chickens just left for a new garden. I rake out what’s left of the compost pile evenly over the bay. 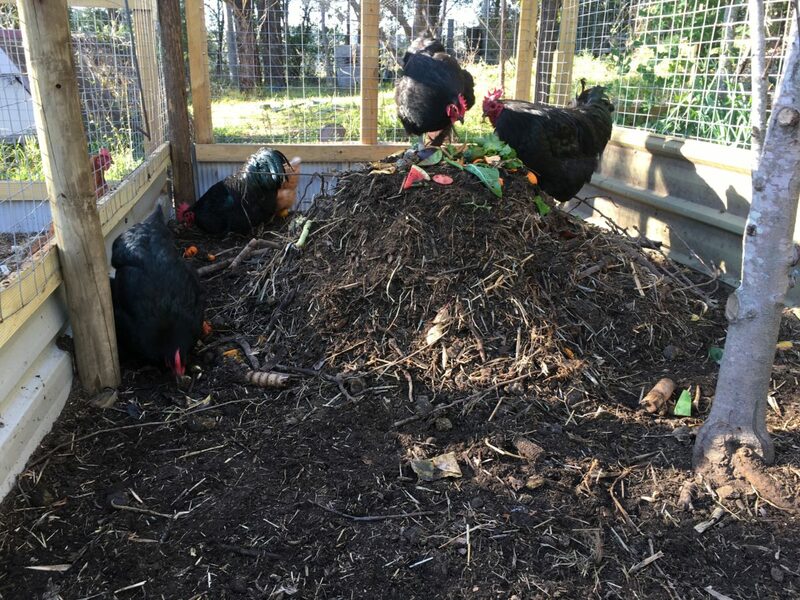 If there are any large or not-yet-decomposed bits, I gather them up and throw them into the new chicken bay to start the next compost pile. I shovel a path down the centre of the bay to form garden beds, and I put pavers, timber or wood chips along the path to provide easy weed- and mud-free access. 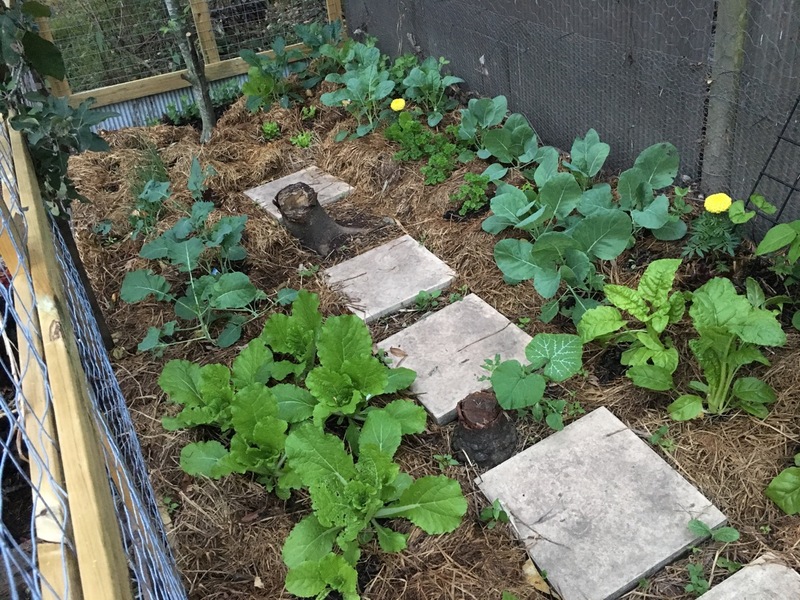 I spread a straw mulch on the newly formed garden beds, and I plant them out with herb and vegetable seedlings appropriate for the time of year. At any given point in time, as well as the freshly-planted bay, the previous bays in the rotation sequence will have 1, 2, 3 and 4 month old plants in them. 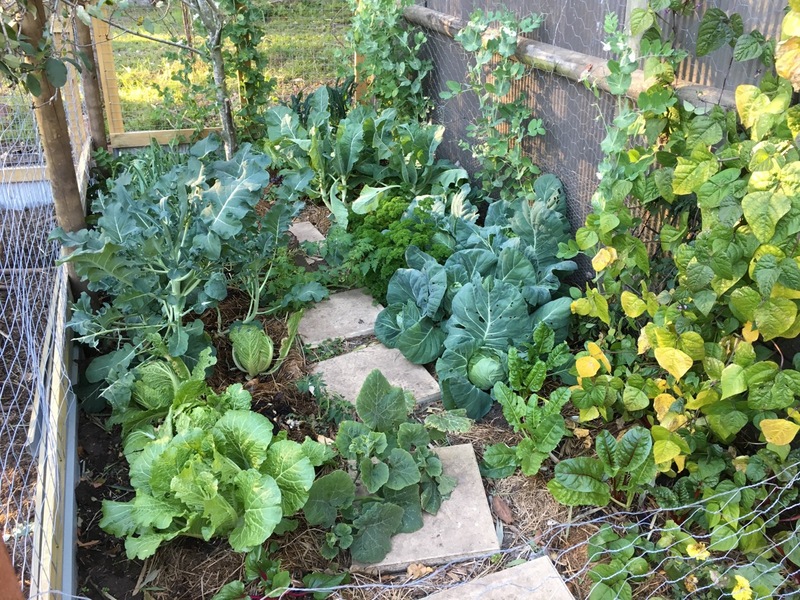 As a vegetable variety reaches the end of its productive life in one bay, a similar variety will just be hitting its stride in the next bay that I planted a month later. The food supply thus continues without interruption. All of this chicken-moving and garden preparation takes me a couple of hours, once a month. I don’t need to do much weeding, since the chickens are eating stray seeds and digging up weed roots before they gain a foothold. The chickens also interrupt pest lifecycles; while problems are not eliminated completely, pests normally don’t build up enough of a population to cause major problems. Living in the country, we have a lot of pressure from birds (particularly cockatoos and satin bower birds) and possums. So I’ve completely covered the whole perimeter (sides and roof) with chicken wire to keep the wildlife out. If I didn’t do that, we wouldn’t get a single tomato or bean! The internal partitions between the bays are half-height, about 1.2m (3′) high. This is high enough to stop our chickens from jumping into the growing bays, but it makes it easy to throw trimmings and weeds over into the chicken bay. All the different elements work together over time, complementing and reinforcing each other. Together they form a system that gives us a continual, uninterrupted supply of fresh vegetables and herbs without the feast-or-famine cycle we’ve had with previous gardens. And as an added bonus, the chickens provide us a continual supply of the highest quality eggs, thanks to their healthy diet and happy lifestyle! I am moving back to the city (very sad) and see this as a perfect option for a much smaller area. Thank you for your ingenuity. This is such a clever idea Darren! Love it! Wish I had the space! Well done! I’m glad you saw this Reena, I was going to bring some photos in to show you! One of those parcels in my PO Box today was more seeds for the garden :-). I really like the organisation, with the scratch yard attached and doors to open and close each bay makes for a system that seems as low labour but high yield and interconnected as you describe. Love it! How long do you keep the chickens in one bay to “deweed” and “debug”? For the whole month or a couple of weeks? Also I noticed you have fruit trees in every bay. Which fruit do you keep here? Thanks Vita. I give the chickens access to the bay for the whole month. After the plants and weeds are cleaned up, they still help dig over and deseed the compost pile. Yes, most bays have fruit trees in them. Before I built the bays, birds and possums got all the fruit from them. I’m hoping that this year I’ll get it! There are two apple trees, a nectarine, a peach, and a fig tree. I’ve pruned the trees back fairly heavily, and am trying to train them along the walls of the bays. Being deciduous, they lose their leaves and let the sun shine through in winter, and will give the veggies some shade during summer. Looks unreal! In your plans there is also a chicken scratch yard. Is this necessary if you have them in the 6th bay? Do you also put a hutch in the 6th bay for roosting and laying? The chickens have a house to roost and lay their eggs in the scratch yard. It’s also a bit more secure than the garden bays, so I lock them in there at night to protect against foxes and dogs. I’ll be planting stuff like bananas in the scratch yard in spring, and protecting them with rings of chicken wire. I think they’ll do well with all the rich manure, and will give the chickens extra shade. If you only had a few chickens, you could put a movable hutch in the chicken bay and keep them in there full-time. This is amazing, i’ll have one! Thanks so much Darren – absolutely inspiring! We’re just getting into veg gardening in a fairly small space and I hoped to have chickens involved but couldn’t see how. Will definitely be doing some measuring and thinking about whether a bit of reorganising of our space will allow us to implement your system. Cheers! That’s great Elaine, I hope you can find a way to fit chickens in. They’re definitely worth the effort. Right now I’ve got about a dozen chickens, but they will be culled down a bit soon. They do have that large scratch area as well, so it’s not too cramped. I’ve mostly got Australorps (roosters and hens), plus some ISA Browns someone was getting rid of. 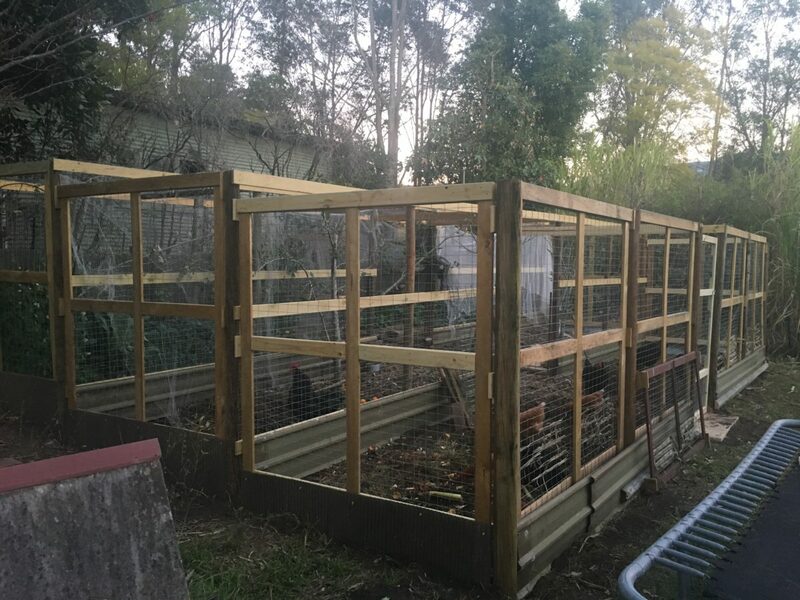 The Australorps are ideal for this system – they scratch and forage well, and are too big to jump over the internal half-height bay walls and gates. I’m planning to let them hatch some chicks in spring to replace the older hens. Darren, terrific mate, can’t wait to take a look. I’ll be in touch……..regards Tony….K.W.G. Thanks Tony! Catch up with you soon. Where do they lay their eggs and roost for the night? Our chickens are housed in the scratch yard. They are fed in there, and that’s where we have their water, shelter, nest boxes and roosts. Hi Darren, Todd showed me this on his recent NZ trip. Such a fantastic system! I’d like to implement something similar, but only have enough space for four bays – I guess rotating every 6 weeks might work? Hi Gemma! Yeah, I reckon it’d work well. I’ve even heard of people running with two garden areas, and just swapping the chickens over every 6 months. I’d love to see photos of what you do! This is brilliant! Bookmarking it and will soon work it into a blog post. We’re talking about redesigning our huge vegetable garden. We keep chickens, ducks, geese and quail as well. I wonder if we could work out something like this at our place with a couple of runner ducks and bantams. It seems like you’ve worked out all the benefits of a flock without the destruction of free ranging. Thanks! It’s still a work in progress, but I’m refining the system as I go. Because I’m planting a new bed every month, I’m trying different techniques all the time (e.g. 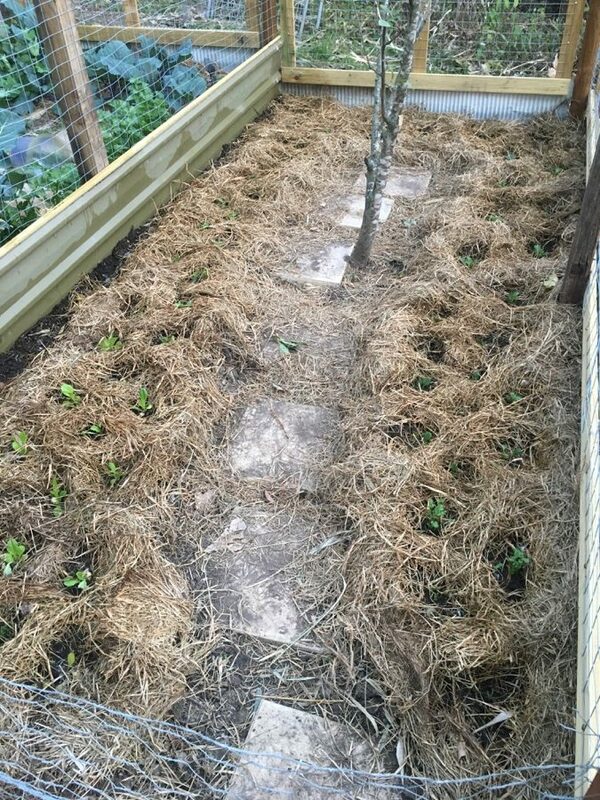 mixing plants around vs grouping similar plants together, different mulches, seedling raising systems, etc) – it’s really accelerated the experimentation! It also gives me an easy way to keep good notes of how much I planted of different varieties, and what we want to plant more or less of in the same month next year. Let me know when you write your blog post!